The Partition of Africa began in earnest with the Berlin Conference of 1884-1885, and was the cause of most of Africa’s borders today. This conference was called by German Chancellor Bismarck to settle how European countries would claim colonial land in Africa and to avoid a war among European nations over African territory. All the major European States were invited to the conference. 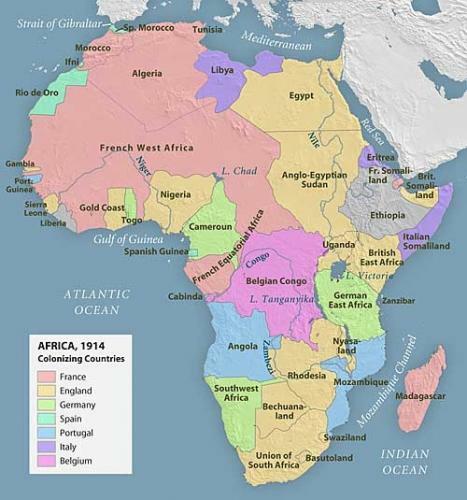 Germany, France, Great Britain, Netherlands, Belgium, Portugal, and Spain were all considered to have a future role in the imperial partition of Africa. The United States was invited because of its interest in Liberia but did not attend because it had no desire to build a colonial empire in Africa. Also invited were Austria–Hungary, Sweden–Norway, Denmark, Italy, Turkey, and Russia who all were considered minor players in the quest for colonizing Africa, though Italy would claim some colonial possessions in Northeast Africa. Most notably there were no Africans present at this conference, nor were any Europeans present to ensure that native Africans had any say in the proceedings. The task of this conference was to ensure that each European country that claimed possession over a part of Africa must bring civilization, in the form of Christianity, and trade to each region that it would occupy. Also a country’s claim of a territory was valid only if it informed the other European powers and established some occupying force on the ground. This occupying force was often a few military outposts on the coast and interior waterways with little to no actual settlement. Specific lands were obtained by having African indigenous rulers sign an “x” to a general agreement for protection by a European power. Often these rulers had no idea what they were signing since most could not read, write, or understand European languages. The conference only dealt with territories yet to be acquired in Africa. This meant that the interior of Africa, about which little was known, was the land area available. Most coastal land had already been claimed by various European countries, as had much of Southern Africa and Africa north of the Sahara. Few Europeans had set foot into the interior of sub-Saharan Africa prior to this conference. Following the Berlin Conference there was still little exploration into the interior of Africa beyond gaining initial treaties. Most Europeans continued to stay on the coastal regions while a few missionaries followed rivers inland to find Christian converts. By 1900, though, more Europeans moved into the African interior to extract raw materials such as rubber, palm oil, gold, copper, and diamonds. These natural resources made Africa a vital resource for the European economy. Although most of these African colonies were controlled by nations, the Berlin Conference allowed King Leopold II of Belgium to become the sole owner of the vast area that is today the Democratic Republic of the Congo in central Africa. This area was given to Leopold by the other European powers with the intent that this be an area of Free Trade for all Europeans in Africa. Leopold agreed to this stipulation as well as bringing Christian missionaries to the interior of this area, but in practice he kept out most other European traders as he granted concessions to various corporations to exploit the region’s resources. In 1908 it was revealed that under King Leopold’s instructions native people of the Congo were forced to farm wild rubber as a form of tax payment to the colonial government. Those who were unable to reach their rubber quota often had a hand or foot chopped off, or were killed by Leopold’s agents. Once news of these abuses of power were brought to the public light, King Leopold was stripped of his colony and the vast Congo region was ruled by the Belgium government until it became independent in 1960. By 1914, 90% of Africa had been divided between seven European countries with only Liberia and Ethiopia remaining independent nations. Many of the boundaries drawn up by Europeans at the Berlin Conference still endure today with little regard to natural landmarks or historic ethnic or political boundaries established by the Africans themselves. The disregard of these boundaries, most of which were retained after independence, often continues to generate conflict in Africa today. African nations began to emerge from colonial rule first with Ghana which gained its independence in 1957. By 2000 virtually all of the former colonies had gained independence. Steig Förster, Wolfgang J. Mommsen, and Ronald Robinson, eds., Bismarck, Europe and Africa: The Berlin Africa Conference, 1884-1885 and the Onset of Partition (London: Oxford University Press, 1988); H. L. Wesseling, Divide and Rule: The Partition of Africa, 1880-1914 (London: Praeger, 1996).